This is a Word Formation task which will be familiar to students who did the First Certificate. Word Formation activities test your ability to change one type of word into another, your ability to use prefixes and suffixes, your spelling, and your reading comprehension. You are given a text with 8 words missing and you must fill in the correct word. It's different from part 2 because in part 3 you are given a base word that you have to change (whereas in part 2 you are given no help). At the end of every line with a word missing you'll see a word in bold, capital letters. That is the word you must transform to be used in that line. Do not use that word to fill in an answer elsewhere on the page! * You need to read the whole text to get the writer's opinion on the topic. That's because you'll have to change some of the words into negative forms, and you can't do that if you only read the sentences containing the missing words. * To do it well you need to understand how sentences are built in English - that means understanding the function of verbs, nouns, adjectives, and adverbs. That sounds hard, but it's really not so bad when you get the hang of it. * Then you need to learn all the different forms of words. This is the hard part! This quick guide is no substitute for getting a proper grammar book, but here are a few quick tips. These things are nouns - names (Captain Jack Sparrow); concepts (time, information); names of jobs or types of people (skiiers, doctors, scientists); things (cheesecake, flowers). - Sometimes you can't spot a noun based on its ending, but sometimes you can. Look out for: -eer; -tion; -ment, -age, -al, ance, -hood, -iety, -ness, and so on. - If you have a word which can be made plural or into a possessive form, it's a noun. (Two solutions/ the solution's result = solution is a noun.) Read the part 3 text carefully to check if you need to make your noun plural! - If you have a determiner in a sentence, look for a noun. If you can't find one that goes with the determiner, the missing word is a noun. Determiners include the, my/your/their (etc), whose, another, other, a/an. In the Cambridge exam you won't have such easy words, of course, and it might not always be so clear which noun the adjective refers to. -able; -ible; -al (careful! this works with nouns too); -ial; -ant; -ate; -ative; -ive; -ing; -ed; -ous; -ly (not always an adverb! ); -y; -ful; -ness; -ic; -ary; -ory. Your grammar book will deal with advanced usage, but this guide will cover a lot of situations. Adverbs describe verbs, other adverbs and adjectives. Adverbs used frequently by Cambridge are increasingly, progressively, dramatically and others which describe the rate of change. Also, they're fond of adverbs that start sentences, such as alternatively, surprisingly, etc. Do you know how to change words into verbs using 'en', 'under', and 'out'? My sleeves are too short - I need to lengthen them. The thrilling music heightened the tension of the final scene. The Prime Minister undertook to find a solution to the crisis. The actress underwent surgery on her nose. The new album outsold the old album by two to one. Red crabs outnumber blue crabs. When you've decided if you need a verb/adjective/etc in a space, and you've got an answer, always read the paragraph again to make sure the meaning is correct. A few words on every test will be negative. Because the text was about Everest, students will quickly fill in 'UNFAVOURABLE'. On careful reading of the sentence, better students realise the word 'safe' is key. The answer therefore should be FAVOURABLE. An EXPECTED problem? But the last bit of the sentence - overcrowded conditions - is the last thing you'd expect on Mount Everest. So here we need the negative form, UNEXPECTED. Alarm! Alarm! Some students think this is the hardest part of the whole exam. And they might be right! It tests a wide range of grammar, vocabulary, and you need to be able to change informal language into formal, active into passive, and more! Can you do this one? The instructions say 'you must use the word given.' It doesn't mean the actual word 'given', it means the word provided! Use between 3-6 words. Most contractions are 2 words (won't, don't = will not, do not). It might be possible to complete the sentence in a grammatically correct way with 2 words, or with 22 words, but you won't get any points for that! Don't change the word. If the word given is 'TO' you can't use 'INTO'. If the word is 'GO' you can't use 'WENT'. As I said, this section is very hard because there's so much you need to know. But each question is worth 2 points. You might not know the whole answer but sometimes one correct word will give you a point. Try to keep the same meaning - If the first sentence says 'Tom said...' then don't write 'He said...' in the second sentence. Check your tenses - if the first sentence is in the past tense, the second should be, too! 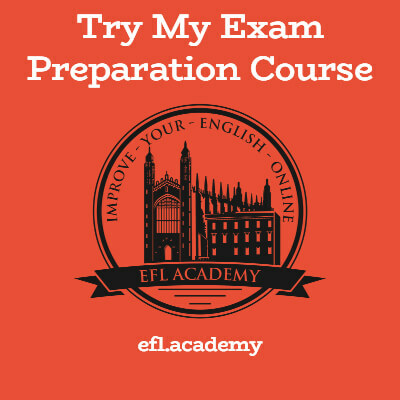 In the introduction to the Reading and Use of English test we suggested you START the exam by doing part 4, and don't spend too long on it. Remember the example question from the intro? It's from the Cambridge CAE handbook. Let's go through it step by step. Anna got the job in spite of experience in public relations. No! That doesn't make any sense. If she had experience in public relations we wouldn't need to use the phrase 'in spite of'. So 'in spite of' has to go at the start. Yes, we have 'of' twice, and it looks weird, but it's the only way. Anna got the job in spite of .......................... of experience in public relations. We've used 3 words and can use a maximum of 3 more. But the good news is that we've already got 1 of the 2 points available. Anna got the job in spite of not having a lot of experience in public relations. Anna got the job in spite of her lack of experience in public relations. As you can see, there's a lot involved in this part of the exam. You'll need to study all kinds of grammar, phrasal verbs, set phrases etc etc etc.